Advances that open new avenues in developing aminoglycoside antibiotics During the last twenty years, there have been numerous advances in the understanding of the chemistry, biochemistry, and recognition of aminoglycosides. This has led to the development of novel antibiotics and opened up new therapeutic targets for intervention. This is the first book to provide a complete overview of recent advances in the field and explore their tremendous potential for drug discovery and rational drug design. 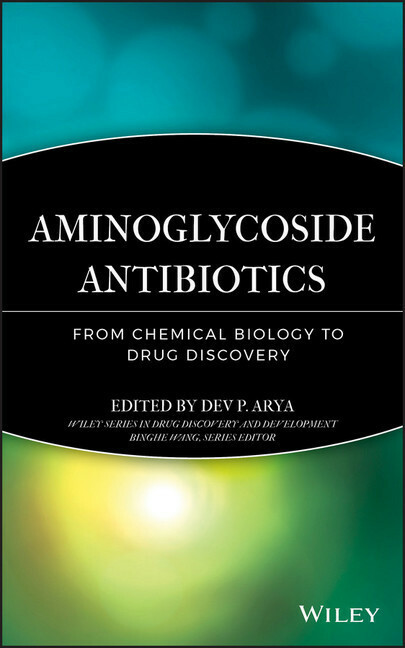 With chapters written by one or more leading experts in their specialty areas, the book addresses the chemistry, biology, and toxicology of aminoglycosides. Aminoglycoside Antibiotics: From Chemical Biology to Drug Discovery is a great resource for academic and industrial researchers in drug design and mechanism studies and for researchers studying antibiotic resistance, antibiotic design and synthesis, and the discovery of novel pharmaceuticals. It is also a valuable reference for graduate students in pharmacy, pharmaceutical science, biophysics, medicinal chemistry, and chemical biology. Dev P. Arya is an Associate Professor of Chemistry and Director of the Laboratory of Medicinal Chemistry at Clemson University. He is a member of the ACS, and currently serves as the Program Chair of the Division of Carbohydrate Chemistry. His research interests lie in the development of nucleic acid targeted drugs.